Our Michigan personal injury lawyers often represent clients who have suffered painful shoulder injuries, like rotator cuff injuries, in Michigan car accident, slip and fall accident, work-related accidents, and all other personal injury accident matters. These injuries often require extensive medical treatment and cause disability from work and recreational activities. It is important that the personal injury attorney be knowledgeable on the various types of shoulder injuries and their treatments. A common shoulder injury, especially from trauma, is a rotator cuff injury. A rotator cuff is an injury to 1 or more of the 4 muscles in the shoulder. This shoulder injury may come on suddenly and be associated with a specific injury such as an auto accident (acute), or it may be something that gets progressively worse over time with activity that aggravates the muscle (chronic). The type of injury can range from an inflammation of the muscle without any permanent damage, such as tendinitis, to a complete or partial tear of the muscle that might require surgery. The shoulder connects the upper arm to the upper part of the body. It consists of 3 bones: the clavicle (collarbone), the scapula (shoulder blade), and the humerus (upper arm bone). Many different ligaments (rubber band -like structures that attach bone to bone) are involved in stabilizing the shoulder joint, particularly in the front. 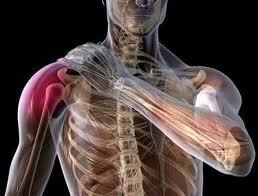 The major stabilizing factors at the back of the joint are the muscles of the rotator cuff. These muscles help to keep the head of the humerus in place against the shoulder blade. The rotator cuff is comprised of 4 muscles (supraspinatus, infraspinatus, teres minor, and subscapularis). The most common symptom of a rotator cuff tear is pain. Many times, it is difficult for a patient to localize the pain to a specific area, and often the patient describes the pain as a generalized discomfort that is exacerbated with specific movements of the shoulder. Pain is often felt over the outside of the shoulder, or even down the arm to the elbow. Depending on the severity of the rotator cuff tear, there may also be a loss of motion. If the injury is an incomplete or partial tear, pain will likely be the most prominent symptom; decreased strength may be demonstrated, but is usually not the patient's primary complaint. However, in a complete rotator cuff tear, the patient will likely be unable to move the shoulder through some normal motions. Many times, the diagnosis of a rotator cuff tear is best made by a physical examination where the doctor can isolate and test the function of the specific muscles that form the rotator cuff. Once there is a suspicion of a rotator cuff tear, the doctor often will order a diagnostic test to confirm the tear. The test used most often is an MRI, but an arthrogram or ultrasound test may also be used to confirm the diagnosis. At first, doctors often treat the injury conservatively with physical therapy, anti-inflammatory medications, and cortisone injections. To learn more about the laws in Michigan shoulder injury accidents, you should request our FREE BOOK, "The Ultimate Guide To Injury Cases in Michigan" which includes The "Biggest Mistakes That Can Ruin Your Injury Case." We will send it out immediately. We will represent you in your Michigan shoulder injury case under our NO FEE PROMISE. This means that you will not be charged any legal fees whatsoever unless we obtain a settlement or recovery for you. You have absolutely no obligation for legal fees unless we win your case. If we do not obtain a settlement for you, you owe us nothing! If you or a family member suffer from shoulder or rotator cuff injuries due to a Michigan accident, you should contact our Michigan shoulder injury lawyers to determine whether a Michigan injury claim should be pursued. We have obtained significant settlements and verdicts for shoulder injury clients.